My mom used to cut out stories like Jean Kwok's from her Chinese magazines and save them for the summers I came home from college. "Look," she'd say, stuffing a slice of orange in her mouth, while simultaneously jabbing her finger at the glossy page of newsprint. "Look at this woman." I'd dutifully stare at the picture of the Chinese woman, usually posed in a grand mansion or other luxury penthouse in Hong Kong. "She was abandoned as a baby. Kidnapped twice. TWICE!" she'd emphasize. "Crawled to a boarded up school on the brink of starvation. And went on to study English at Cambridge, then Harvard medical school and is now a heart surgeon who provides medical aid to refugees from war torn countries. AND she's set up a charity. AND -" and here my mother pauses for dramatic effect. "She's DEAF." "Mmm ... Wowwww," I murmur, edging out of the room. She casts a critical eye on me at this point. "Now, this could be you!" she trills. "No!" she shouts, bits of orange peel scattering off the paper towel she's carefully folded over her lap. "Look at how much she has been through! And yet, she still managed to achieve so much! So it should be no problem for you, my well-provided-for child, to get into medical or law school. At Harvard. Or Yale." She smiles gleefully as I roll my eyes and am finally allowed to take my leave from her Oprah-lair. Tale after tale of overcoming adversity was thrown at me. This man lost two arms but made a fortune making greeting cards with a pen in his mouth. This woman's parents were murdered in front of her as a child when they were ambushed by terrorists but is now a highly successful international human rights attorney after graduating from Harvard law. When I ruined my chances of getting into either medical or law school, those clippings stopped altogether and were never mentioned again. 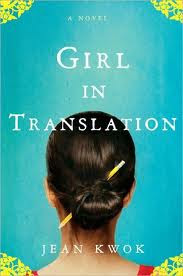 So it's no surprise that I picked up Jean Kwok's Girl in Translation with a bit of inward rolling of the eyes. Truth was, I've heard her story before and they failed to move me anymore. But something about her bio piqued my curiosity: born in Hong Kong, Kwok immigrated to Brooklyn and worked with her family in her sweatshop, before eventually graduating with a bachelor's degree from Harvard and an MFA in fiction from Columbia. In this case, I was less interested in the end result than her journey. Although Girl in Translation is labeled "a novel" on the cover rather than "a memoir", it seems quite obvious that Kwok's own experiences of immigration and practical enslavement in a clothing factory informs this semi-autobiographical novel. Again, throughout, I was more impressed by her story than the prose, which at times, entered into the dreaded cheesy-territory. But to think that this woman survived the adversity she encountered, having spoken no English when entering the country, to write with such fluidity and grace really - I must admit - struck me with a true sense of awe. In particular, I was moved by the main character, Kimberly Chang's, relationship to her mother, who accompanied her through this journey through hell and back. I read the first few chapters with a constant lump in my throat and found it very difficult to extract myself from the book even when I'd stopped reading it. I felt the devastating sense of helplessness, loneliness and worst of all, humiliation and shame, that was encapsulated in a string of mispronounced English words sneered at by Kimberly's first school teacher. Or the way mother and daughter huddled together in a roach and rat-infested apartment with no heating in the middle of a New York winter for warmth. Although my own parents immigrated to the US under the extreme opposite of circumstances, I could not help but draw upon their seldom-spoken-of stories of integration into American society - it's the idea of being an outsider that really resonated with me, and Kimberly's constant desire to get her and her mother out of the terrible situation they were in, but to be accepted and loved by her new friends and ultimately, country. I could especially relate to the familiar Cantonese sayings and slangs that I grew up with and still use, although I found it a bit unnecessary and ineffective, really, for Kwok to literally translate such sayings into English, such as: "Ma studied me, then smiled. 'Silly girl, why are you talking the big words?' She was asking why I was lying." In Cantonese, "talking big words" is the literal translation for "lying" - but I found the continuous translations distracting and even clumsy at times, distracting the reader (especially non-Cantonese speaking readers) from the book. Despite this and the slightly fairytale ending (which I won't give away, don't worry), I found this novel incredibly sad but equally warm and touching - proof that overcoming adversity isn't always a magazine-printed cliche. omg my mom too! well maybe not quite as strongly but yeah totally. also a book that really resonates with me in an outsider perspective was the namesake by jhumpa lahiri. it might not be quite as right for you because it's definitely not only an indian perspective but a bengali perspective on growing up in the US but i thought it was really good. I love Jhumpa Lahiri - especially The Namesake. That movie made me really sad and even though it wasn't a "Chinese" perspective, it was definitely an "Asian" perspective and it really resonated with me as well.